The Phoenix Style Flower Arrangement! Do you enjoy flowers but would like to feel a deeper connection while working with them? Then I recommend trying a Phoenix style arrangement. The Phoenix Style Flower Arrangement is made up of a compact round base with straight lines bursting out from the center. It’s shape and strong lines represent the mythological Phoenix. The Phoenix is a mythological creature that is consistently characterized as a bird with brightly colored plumage, which, after a long life, dies in a fire of its own making only to rise again from the ashes. The Phoenix represents rebirth, renewel and strength. And springtime is a perfect time of year to make this arrangement. There are lovely spring flowers coming to life and beautiful blooming branches available. Here another version of a Phoenix style arrangement…round compact base with lines bursting from the center. The Quince branches I used in the first arrangement were still budding and blooming, but some of the flowers were in decline a few days later. So pulled out the freshest looking florals and reworked the phoenix style arrangement into my milk glass head vase. With the renewal, she demanded her presence in the reading corner. This Phoenix style arrangement pictured below was made by Ralph Rios in the ACC floral lab. Forsythia Branches were used for it’s center bursting lines and Hydrangea Brunia, and Roses in the compact round base. Love these delicious bright colors! Yes, a Phoenix in the spring….it just makes sense. 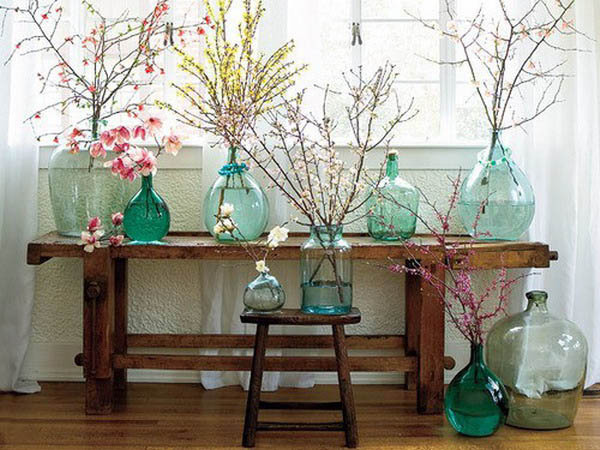 Gather some delicious flowering branches and some brightly colored round shaped flowers. Then fill around the branches making a tight compact base representing the renew. And then enjoy your “therapy session” all week long. And just in case you need a bit more nudging….look at all the beautiful spring blooming branches out there right now. So go grab those snippers and bring some flower-empowerment into your life today!